This article is about education upon the completion of a first degree, known as graduate education within North America. For other uses, see Postgraduate training in education. Postgraduate education, or graduate education in North America, involves learning and studying for academic or professional degrees, academic or professional certificates, academic or professional diplomas, or other qualifications for which a first or bachelor's degree generally is required, and it is normally considered to be part of higher education. In North America, this level is typically referred to as graduate school (or sometimes colloquially as grad school). There are two main types of degrees studied for at the postgraduate level: academic and vocational degrees. Although systems of higher education date back to ancient Greece, ancient Rome, China, ancient India and Arabian Peninsula, the concept of postgraduate education depends upon the system of awarding degrees at different levels of study, and can be traced to the workings of European medieval universities, mostly Italians. University studies took six years for a bachelor's degree and up to twelve additional years for a master's degree or doctorate. The first six years taught the faculty of the arts, which was the study of the seven liberal arts: arithmetic, geometry, astronomy, music theory, grammar, logic, and rhetoric. The main emphasis was on logic. Once a Bachelor of Arts degree had been obtained, the student could choose one of three faculties—law, medicine, or theology—in which to pursue master's or doctor's degrees. 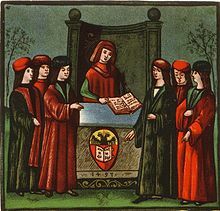 The degrees of master (from Latin magister) and doctor (from Latin doctor) were for some time equivalent, "the former being more in favour at Paris and the universities modeled after it, and the latter at Bologna and its derivative universities. At Oxford and Cambridge a distinction came to be drawn between the Faculties of Law, Medicine, and Theology and the Faculty of Arts in this respect, the title of Doctor being used for the former, and that of Master for the latter." Because theology was thought to be the highest of the subjects, the doctorate came to be thought of as higher than the master's. The main significance of the higher, postgraduate degrees was that they licensed the holder to teach ("doctor" comes from Latin docere, "to teach"). Master's degrees. These are sometimes placed in a further hierarchy, starting with degrees such as the Master of Arts (from Latin Magister artium; M.A.) and Master of Science (from Latin Magister scientiæ; M.Sc.) degrees, then the Master of Philosophy degree (from Latin Magister philosophiæ; M.Phil. ), and finally the Master of Letters degree (from Latin Magister litterarum; M.Litt.) (all formerly known in France as DEA or DESS before 2005, and nowadays Masters too). In the UK, master's degrees may be taught or by research: taught master's degrees include the Master of Science and Master of Arts degrees which last one year and are worth 180 CATS credits (equivalent to 90 ECTS European credits), whereas the master's degrees by research include the Master of Research degree (M.Res.) which also lasts one year and is worth 180 CATS or 90 ECTS credits (the difference compared to the Master of Science and Master of Arts degrees being that the research is much more extensive) and the Master of Philosophy degree which lasts two years. In Scottish Universities, the Master of Philosophy degree tends to be by research or higher master's degree and the Master of Letters degree tends to be the taught or lower master's degree. In many fields such as clinical social work, or library science in North America, a master's is the terminal degree. Professional degrees such as the Master of Architecture degree (M.Arch.) can last to three and a half years to satisfy professional requirements to be an architect. Professional degrees such as the Master of Business Administration degree (M.B.A.) can last up to two years to satisfy the requirement to become a knowledgeable business leader. Doctorates. These are often further divided into academic and professional doctorates. An academic doctorate can be awarded as a Doctor of Philosophy degree (from Latin Doctor philosophiæ; Ph.D. or D.Phil.) or as a Doctor of Science degree (from Latin Doctor scientiæ; D.Sc.). The Doctor of Science degree can also be awarded in specific fields, such as a Doctor of Science in Mathematics degree (from Latin Doctor scientiarum mathematic arum; D.Sc.Math. ), a Doctor of Agricultural Science degree (from Latin Doctor scientiarum agrariarum; D.Sc.Agr. ), a Doctor of Business Administration degree (D.B.A. ), etc. In some parts of Europe, doctorates are divided into the Doctor of Philosophy degree or "junior doctorate", and the "higher doctorates" such as the Doctor of Science degree, which is generally awarded to highly distinguished professors. A doctorate is the terminal degree in most fields. In the United States, there is little distinction between a Doctor of Philosophy degree and a Doctor of Science degree. In the UK, Doctor of Philosophy degrees are often equivalent to 540 CATS credits or 270 ECTS European credits, but this is not always the case as the credit structure of doctoral degrees is not officially defined. In some countries such as Finland and Sweden, there is the degree of Licentiate, which is more advanced than a master's degree but less so than a Doctorate. Credits required are about half of those required for a doctoral degree. Coursework requirements are the same as for a doctorate, but the extent of original research required is not as high as for doctorate. Medical doctors for example are typically licentiates instead of doctors. In the UK and countries whose education systems were founded on the British model, such as the US, the master's degree was for a long time the only postgraduate degree normally awarded, while in most European countries apart from the UK, the master's degree almost disappeared. In the second half of the 19th century, however, US universities began to follow the European model by awarding doctorates, and this practice spread to the UK. Conversely, most European universities now offer master's degrees parallelling or replacing their regular system, so as to offer their students better chances to compete in an international market dominated by the American model. In the UK, an equivalent formation to doctorate is the NVQ 5 or QCF 8. Postgraduate education can involve studying for qualifications such as postgraduate certificates and postgraduate diplomas. They are sometimes used as steps on the route to a degree, as part of the training for a specific career, or as a qualification in an area of study too narrow to warrant a full degree course. In Argentina, the admission to a Postgraduate program at an Argentine University requires the full completion of any undergraduate course, called in Argentina "carrera de grado" (v.gr. Licenciado, Ingeniero or Lawyer degree). The qualifications of 'Licenciado', 'Ingeniero', or the equivalent qualification in Law degrees (a graduate from a "carrera de grado") are similar in content, length and skill-set to a joint first and second cycles in the qualification framework of the Bologna Process (that is, Bachelor and Master qualifications). Upon completion of at least two years' research and coursework as a postgraduate student, a candidate must demonstrate truthful and original contributions to his or her specific field of knowledge within a frame of academic excellence. The Master and Doctoral candidate's work should be presented in a dissertation or thesis prepared under the supervision of a tutor or director, and reviewed by a postgraduate Committee. This Committee should be composed of examiners external to the program, and at least one of them should also be external to the institution. Professional Doctorates, which are usually more strenuous and of a longer duration than a master's degree, e.g. 36 months in duration. Research degrees generally consist of either Masters or Doctorate programs. In some disciplines it is acceptable to go straight from the undergraduate degree into a Ph.D. program if one achieves a very good Honors degree (see Admissions below), and in others, it may be encouraged or expected or simply advantageous in varying amounts for the student to first undertake a research Masters before applying to Ph.D. programs. Research master's degrees may be still called an M.A. or M.Sc., like a course work Masters, or may have a special appellation, e.g. M.Phil. Doctorate programs may lead to the award of a Ph.D. or a D.Phil. depending on the university or faculty. The D.Litt is a higher research degree for exemplary achievement. Generally, the Australian higher education system follows that of its British counterpart (with some notable exceptions). Entrance is decided by merit, entrance to coursework-based programmes is usually not as strict; most universities usually require a "Credit" average as entry to their taught programmes in a field related to their previous undergraduate. On average, however, a strong "Credit" or "Distinction" average is the norm for accepted students. Not all coursework programs require the student to already possess the relevant undergraduate degree, they are intended as "conversion" or professional qualification programs, and merely any relevant undergraduate degree with good grades is required. Ph.D. entrance requirements in the higher ranked schools typically require a student to have postgraduate research honours or a master's degree by research, or a master's with a significant research component. Entry requirements depend on the subject studied and the individual university. The minimum duration of a Ph.D. programme is two years, but completing within this time span is unusual, with Ph.D.s usually taking an average of three to four years to be completed. Most of the confusion with Australian postgraduate programmes occurs with the research-based programmes, particularly scientific programmes. Research degrees generally require candidates to have a minimum of a second-class four-year honours undergraduate degree to be considered for admission to a Ph.D. programme (M.Phil. are an uncommon route). In science, a British first class honours (3 years) is not equivalent to an Australian first class honours (1 year research postgraduate programme that requires a completed undergraduate (pass) degree with a high grade-point average). In scientific research, it is commonly accepted that an Australian postgraduate honours is equivalent to a British master's degree (in research). There has been some debate over the acceptance of a three-year honours degree (as in the case of graduates from British universities) as the equivalent entry requirement to graduate research programmes (M.Phil., Ph.D.) in Australian universities. The letters of Honours programmes also added to the confusion. For example: B.Sc. (Hons) are the letters gained for postgraduate research honours at the University of Queensland. B.Sc. (Hons) does not indicate that this honours are postgraduate qualification. The difficulty also arises between different universities in Australia—some universities have followed the UK system. There are many professional programs such as medical and dental school require a previous bachelors for admission and are considered graduate or Graduate Entry programs even though they culminate in a bachelor's degree. Example, the Bachelor of Medicine (MBBS) or Bachelor of Dentistry (BDent). There has also been some confusion over the conversion of the different marking schemes between British, US, and Australian systems for the purpose of assessment for entry to graduate programmes. The Australian grades are divided into four categories: High Distinction, Distinction, Credit, and Pass (though many institutions have idiosyncratic grading systems). Assessment and evaluation based on the Australian system is not equivalent to British or US schemes because of the "low-marking" scheme used by Australian universities. For example, a British student who achieves 70+ will receive an A grade, whereas an Australian student with 70+ will receive a Distinction which is not the highest grade in the marking scheme. The Australian government usually offer full funding (fees and a monthly stipend) to its citizens and permanent residents who are pursuing research-based higher degrees. There are also highly competitive scholarships for international candidates who intend to pursue research-based programmes. Taught-degree scholarships (certain master's degrees, Grad. Dip., Grad. Cert., D.Eng., D.B.A.) are almost non-existent for international students, so they are usually required to be self-funded. Requirements for the successful completion of a taught master's programme are that the student pass all the required modules. Some universities require eight taught modules for a one-year programme, twelve modules for a one-and-a-half-year programme, and twelve taught modules plus a thesis or dissertation for a two-year programme. The academic year for an Australian postgraduate programme is typically two semesters (eight months of study). Requirements for research-based programmes vary among universities. Generally, however, a student is not required to take taught modules as part of their candidacy. It is now common that first-year Ph.D. candidates are not regarded as permanent Ph.D. students for fear that they may not be sufficiently prepared to undertake independent research. In such cases, an alternative degree will be awarded for their previous work, usually an M.Phil. or M.Sc. by research. In Brazil, a Bachelor's, Licenciate or Technologist degree is required in order to enter a graduate program, called pós-graduação. Generally, in order to be accepted, the candidate must have above average grades and it is highly recommended to be initiated on scientific research through government programs on undergraduate areas, as a complement to usual coursework. The competition for public universities is very large, as they are the most prestigious and respected universities in Brazil. Public universities do not charge fees for urdergraduate level/course. Funding, similar to wages, is available but is usually granted by public agencies linked to the university in question (i.e. FAPESP, CAPES, CNPq, etc. ), given to the students previously ranked based on internal criteria. There are two types of postgraduate; lato sensu (Latin for "in broad sense"), which generally means a specialization course in one area of study, mostly addressed to professional practice, and stricto sensu (Latin for "in narrow sense"), which means a Master of Science or Doctorate, encompassing broader and profound activities of scientific research. Admission to a graduate certificate program requires a university degree (or in some cases, a diploma with years of related experience). English speaking colleges require proof of English language proficiency such as IELTS. Some colleges may provide English language upgrading to students prior to the start of their graduate certificate program. Admission to a master's (non-thesis) program generally requires a bachelor's degree in a related field, with sufficiently high grades usually ranging from B+ and higher (note that different schools have different letter grade conventions, and this requirement may be significantly higher in some faculties), and recommendations from professors. Admission to a high-quality thesis-type master's program generally requires an honours bachelor or Canadian bachelor with honours, samples of the student's writing as well as a research thesis proposal. Some programs require Graduate Record Exams (GRE) in both the general examination and the examination for its specific discipline, with minimum scores for admittance. At English-speaking universities, applicants from countries where English is not the primary language are required to submit scores from the Test of English as a Foreign Language (TOEFL). Nevertheless, some French speaking universities, like HEC Montreal, also require candidates to submit TOEFL score or to pass their own English test. Admission to a doctoral program generally requires a thesis-type master's degree in a related field, sufficiently high grades, recommendations, samples of writing, a research proposal, and typically an interview with a prospective supervisor. Requirements are often set higher than those for a master's program. In exceptional cases, a student holding an honours bachelor or Canadian bachelor with honours with sufficiently high grades and proven writing and research abilities may be admitted directly to a Ph.D. program without the requirement to first complete a master's. Many Canadian graduate programs allow students who start in a master's to "reclassify" into a Ph.D. program after satisfactory performance in the first year, bypassing the master's degree. High-performing students may be admitted to the "Ph.D.2" (2nd Ph.D. year) of a five-year Ph.D. program if they are holders of one of the rare thesis-type M.A. degrees which require a combined "M.A./Ph.D.1" program. Graduate students must usually declare their research goal or submit a research proposal upon entering grad school; in the case of master's degrees, there will be some flexibility (that is, one is not held to one's research proposal, although major changes, for example from premodern to modern history, are discouraged). In the case of Ph.D.s, the research direction is usually known as it will typically follow the direction of the master's research. Master's degrees can possibly be completed in one year but normally take at least two, or in the case of a required research-based thesis a maximum of three; they typically do not exceed five years. Doctoral degrees require a minimum of three years but frequently take much longer, not usually exceeding six years. Graduate students may take out student loans, but instead they often work as teaching or research assistants. Students often agree, as a condition of acceptance to a programme, not to devote more than twelve hours per week to work or outside interests. Funding is available to first-year masters students whose transcripts reflect exceptionally high grades; this funding is normally given in the second year. Funding for Ph.D. students comes from a variety of sources, and many universities waive tuition fees for doctoral candidates. Funding is available in the form of scholarships, bursaries and other awards, both private and public. Graduate certificates require between eight and sixteen months of study. The length of study depends on the program. Graduate certificates primarily involve coursework. However, some may require a research project or a work placement. Both master's and doctoral programs may be done by coursework or research or a combination of the two, depending on the subject and faculty. Most faculties require both, with the emphasis on research, and with coursework being directly related to the field of research. Master's candidates undertaking research are typically required to complete a thesis comprising some original research and ranging from seventy to two-hundred pages. Some fields may require candidates to study at least one foreign language if they have not already earned sufficient foreign-language credits. Some faculties require candidates to defend their thesis, but many do not. Those that do not, often have a requirement of taking two additional courses, at minimum, in lieu of preparing a thesis. Ph.D. candidates undertaking research must typically complete a thesis, or dissertation, consisting of original research representing a significant contribution to their field, and ranging from two-hundred to five-hundred pages. Most Ph.D. candidates will be required to sit comprehensive examinations—examinations testing general knowledge in their field of specialization—in their second or third year as a prerequisite to continuing their studies, and must defend their thesis as a final requirement. Some faculties require candidates to earn sufficient credits in a third or fourth foreign language; for example, most candidates in modern Japanese topics must demonstrate ability in English, Japanese, and Mandarin, while candidates in pre-modern Japanese topics must demonstrate ability in English, Japanese, Classical Chinese, and Classical Japanese. At English-speaking Canadian universities, both master's and Ph.D. theses may be presented in English or in the language of the subject (German for German literature, for example), but if this is the case an extensive abstract must be also presented in English. In exceptional circumstances, a thesis may be presented in French. The exception to this rule is McGill University, where all work can be submitted in either English or French, unless the purpose of the course of study is acquisition of a language. French-speaking universities have varying sets of rules; some (e.g. HEC Montreal) will accept students with little knowledge of French if they can communicate with their supervisors (usually in English). Prior to 2004, when the European system of LMD Bologna process was founded, the French equivalent of a Post Graduate degree was called a "Maitrise". For historical reasons dating back to the French Revolution of 1789, France has a dual education system, with Grandes Écoles on one side, and universities on the other hand, with the Grandes Écoles being considered as much more prestigious. Some Grandes écoles deliver the French diplôme d'ingénieur, which is ranked as a master's degree. Note that France ranks a professional doctorate in health sciences (i.e. physician, surgeon, dentist, veterinarian diplomas) as equivalent to a master's degree in any other discipline, to account for the difficulty gap between getting a medical degree and getting non health related doctoral degrees, the latter requiring much tougher research. There are 87 public universities in France, and also some private universities, and they are based upon the European education ladder including bachelors, Masters, and Ph.D.s. Students gain each degree though the successful completion of a predetermined number of years in education, gaining credits via the European Credit Transfer System (ECTS). There are over 300 doctoral programs that collaborate with 1200 research laboratories and centers. Each degree has a certain set of national diplomas that are all of equal value, irrespective of where they were issued. There are also other diplomas that are exclusive to France and are very hard to attain. In some programs in the traditional German system and the traditional Dutch system, there is no legal distinction between "undergraduate" and "postgraduate". In such programs, all education aims towards the master's degree, whether introductory (Bachelor's level) or advanced (master's level). These one-tier programmes take between 4.5 and 5 years. In the meantime, Germany introduced the Bologna process with a separation between Bachelor and Master programmes in many fields, except for education studies, law and other specially regulated subjects. In the Republic of Ireland higher education is operated by the Higher Education Authority. Admission to a postgraduate degree programme in Nigeria requires a bachelor's degree with at least a Second Class Lower Division (not less than 2.75/5). Admission to Doctoral programmes requires an Academic master's degree with a minimum weighted average of 60% (B average or 4.00/5). In addition to this, applicants may be subjected to written and oral examinations depending on the school. Most universities with high numbers of applicants have more stringent admission processes. Postgraduate degrees in Nigeria include M.A., M.Sc., M.Ed., M.Eng., LL.M, M.Arch., M.Agric., M.Phil., PhD. The master's degree typically take 18–36 months with students undertaking coursework and presenting seminars and a dissertation. The doctoral degree is for a minimum of 36 months and may involve coursework alongside the presentation of seminars and a research thesis. Award of postgraduate degrees requires a defence of the completed research before a panel of examiners comprising external and internal examiners, Head of Department, Departmental Postgraduate Coordinator, Representative(s) of Faculty and Postgraduate School, and any other member of staff with a PhD in the department/faculty. Admission to undertake a research degree in the UK typically requires a good bachelor's degree, or Scottish M.A., (at least lower second, but usually an upper second or first class). In some institutions Doctoral candidates are initially admitted to a Masters in Research Philosophy (M.Phil. or M.Res. ), then later transfer to a Ph.D./D.Phil. if they can show satisfactory progress in their first 8–12 months of study. Candidates for the degree of Doctor of Education (Ed.D) are typically required to hold a good bachelor's degree as well as an appropriate master's degree before being admitted. Funding for postgraduate study in the UK is awarded competitively, and usually is disseminated by institution (in the form of a certain allocation of studentships for a given year) rather than directly to individuals. There are a number of scholarships for master's courses, but these are relatively rare and dependent on the course and class of undergraduate degree obtained (usually requiring at least a lower second). Most master's students are self-funded. Funding is available for some Ph.D./D.Phil. courses. As at the master's level, there is more funding available to those in the sciences than in other disciplines. Such funding generally comes from Research Councils such as the Engineering and Physical Sciences Research Council (EPSRC), Arts and Humanities Research Council (AHRC), Medical Research Council (MRC) and others. Masters students may also have the option of a Postgraduate loan introduced by the UK Government in 2016. For overseas students, most major funding applications are due as early as twelve months or more before the intended graduate course will begin. This funding is also often highly competitive. The most widely available, and thus important, award for overseas students is the Overseas Research Student (ORS) Award, which pays the difference in university fees between an overseas student and a British or EU resident. However, a student can only for one university apply for the ORS Award, often before he or she knows whether they have been accepted. As of the 2009/2010 academic year, the HEFCE has cancelled the Overseas Research Student Award scheme for English and Welsh universities. The state of the scheme for Scottish and Northern Irish universities is currently unclear. Students studying part-time for a master's degree can apply for income-based Jobseeker's Allowance provided their timetabled hours are fewer than 16 hours per week. This also entitles the student to housing benefit provided by their local council. Full-time students (of any type) are not normally eligible for state benefits, including during vacation time. Additionally, doctoral students who have advanced to candidacy but not filed a dissertation ("ABD," for "all but dissertation") often receive master's degrees and an additional master's called a Master of Philosophy, or M.Phil., or C.Phil. "Candidate in Philosophy" degree. The master's component of a doctorate program often requires one or two years, and some students, because doctoral programs are sometimes better-funded, apply for doctoral programs while only intending to earn a master's degree. This is generally not acceptable and, if a student's advisor learns of the student's plans, can result in early termination. Many graduate programs require students to pass one or several examinations in order to demonstrate their competence as scholars. In some departments, a comprehensive examination is often required in the first year of doctoral study, and is designed to test a student's background undergraduate-level knowledge. Examinations of this type are more common in the sciences and some social sciences, and relatively unknown in most humanities disciplines. Some graduate students perform teaching duties, often serving as graders, tutors, or teaching assistants. In some departments, they can be promoted to Lecturer status, a position that comes with more responsibilities. Doctoral students generally spend roughly their first two to three years doing coursework, and begin research by their second year if not before. Many master's and all specialist students will perform research culminating in a paper, presentation, and defense of their research. This is called the master's thesis (or, for Educational Specialist students, the specialist paper). However, many US master's degree programs do not require a master's thesis, focusing instead primarily on course work or on "practicals" or "workshops". Such "real-world" experience may typically require a candidate work on a project alone or in a team as a consultant, or consultants, for an outside entity approved or selected by the academic institution, and under faculty supervision. In the second and third years of study, doctoral programs often require students to pass more examinations. Programs often require a Qualifying Examination ("Quals"), a Ph.D. Candidacy Examination ("Candidacy"), or a General Examination ("Generals") designed to test the students' grasp of a broad sample of their discipline, or one or several Special Field Examinations ("Specials") which test students in their narrower selected areas of specialty within the discipline. If these examinations are held orally, they may be known colloquially as "orals". For some social science and many humanities disciplines, where graduate students may or may not have studied the discipline at the undergraduate level, these exams will be the first set, and be based either on graduate coursework or specific preparatory reading (sometimes up to a year's work in reading). In all cases, comprehensive exams are normally both stressful and time-consuming and must be passed to be allowed to proceed on to the thesis. Passing such examinations allows the student to stay, begin doctoral research, and rise to the status of a doctoral candidate while failing usually results in the student leaving the program or re-taking the test after some time has passed (usually a semester or a year). Some schools have an intermediate category, passing at the master's level, which allows the student to leave with a master's without having completed a master's thesis. For the next several years, the doctoral candidate primarily performs his or her research. Usually this lasts three to eight years, though a few finish more quickly and some take substantially longer. In total, the typical doctoral degree takes between four and eight years from entering the program to completion though this time varies depending upon the department, thesis topic, and many other factors. For example, astronomy degrees take five to six years on average, but observational astronomy degrees take six to seven due to limiting factors of weather, while theoretical astronomy degrees take five. Though there is substantial variation among universities, departments, and individuals, humanities and social science doctorates on average take somewhat longer to complete than natural science doctorates. These differences are due to the differing nature of research between the humanities and some social sciences and the natural sciences, and to the differing expectations of the discipline in coursework, languages and length of thesis. However, time required to complete a doctorate also varies according to the candidate's abilities and choice of research. Some students may also choose to remain in a program if they fail to win an academic position, particularly in disciplines with a tight job market; by remaining a student, they can retain access to libraries and university facilities, while also retaining an academic affiliation, which can be essential for conferences and job-searches. Traditionally, doctoral programs were only intended to last three to four years and, in some disciplines (primarily the natural sciences), with a helpful advisor, and a light teaching load, it is possible for the degree to be completed in that amount of time. However, increasingly many disciplines, including most humanities, set their requirements for coursework, languages and the expected extent of thesis research by the assumption that students will take five years minimum or six to seven years on average; competition for jobs within these fields also raises expectations on the length and quality of theses considerably. In some disciplines, doctoral programs can average seven to ten years. Archaeology, which requires long periods of research, tends towards the longer end of this spectrum. The increase in length of degree is a matter of great concern for both students and universities, though there is much disagreement on potential solutions to this problem. There are also discipline-specific differences. A person applying for a doctoral program in Biblical studies or theology from a seminary or theological school must already hold a first professional degree in the field, known as the Master of Divinity degree (M.Div.). The M.Div. is a three-year master's program, however, a thesis is usually not required before completion. The M.Div. is the entry degree for the Doctor of Ministry degree (D.Min) or the Ph.D. The D.Min degree is a second professional degree, which includes two years of study and one to two years of research and a project in the candidates local area of work. The Ph.D. degree in this area follows other Ph.D. programs with two years of seminars, comprehensive exams (usually not oral), and then if a person passes the exam, a dissertation. An alternative terminal degree after the M.Div. is a Master's of Theology (Th.M). a Th.M is one year of seminary study followed by a shorter thesis (usually around one hundred pages) that does not necessarily have to be a unique contribution to the field (unlike a dissertation). A person who fails the comprehensive exam in this discipline may also be awarded a Th.M. Many departments, especially those in which students have research or teaching responsibilities, offer tuition-forgiveness and a stipend that pays for most expenses. At some elite universities, there may be a minimum stipend established for all Ph.D. students, as well as a tuition waiver. The terms of these stipends vary greatly, and may consist of a scholarship or fellowship, followed by teaching responsibilities. At many elite universities, these stipends have been increasing, in response both to student pressure and, especially, to competition among the elite universities for graduate students. In some fields, research positions are more coveted than teaching positions because student researchers are typically paid to work on the dissertation they are required to complete anyway, while teaching is generally considered a distraction from one's work. Research positions are more typical of science disciplines; they are relatively uncommon in humanities disciplines, and where they exist, they rarely allow the student to work on their own research. Departments often have money for limited discretionary funding to supplement minor expenses such as research trips and travel to conferences. A few students can attain outside fellowships such as the National Science Foundation (NSF) and National Physical Science Consortium (NPSC). Funding differs greatly by departments and universities; some universities give five years of full funding to all Ph.D. students, though often with a teaching requirement attached; other universities do not. Foreign students are typically funded the same way as domestic (US) students, although federally subsidized student and parent loans and work-study assistance are generally limited to US citizens and nationals, permanent residents, and approved refugees. Moreover, some funding sources (such as many NSF fellowships) may only be awarded to domestic students. Other factors contributing to possible financial difficulties include high costs to visit their families back home, supporting one's family who is not allowed to work due to immigration laws, tuition that is steep by world standards, and large fees: visa fees by US Citizenship and Immigration Services, surveillance fees (such as Student and Exchange Visitor Information Systems, or SEVIS) by the United States Congress and the United States Department of Homeland Security. ^ "Postgraduate | SmartStudent". SmartStudent. Retrieved 2018-07-05. ^ "International - University of Bologna". www.unibo.it. Retrieved 2018-07-05. ^ "The value of a postgraduate degree". the Guardian. 2002-03-09. Retrieved 2018-07-05. ^ "ECTS: European Credit Transfer and Accumulation System — Ghent University". www.ugent.be. Retrieved 2018-07-05. ^ "Master of Business Administration (M.B.A.)". ^ "Licentiatexamen – 2 år - Antagning.se". antagning.se. ^ "FINLEX ® - Säädökset alkuperäisinä: Valtioneuvoston asetus yliopistojen tutkinnoista 794/2004". www.finlex.fi. ^ "What are Honorary Doctorate Degrees?". Study.com. Retrieved 2018-07-05. ^ "Higher education, Postgraduate". Studies In Australia. Hobsons Australia Pty Ltd. Retrieved 29 December 2014. ^ Smith, Jo (2016-02-04). "Postgraduate study options, course types, masters degree - Future Students | Curtin University, Perth, Australia". Future students. Retrieved 2018-07-05. ^ 1997), Digital Media Unit (Phone: 9266 (2009-02-11). "What the different degree types mean". courses.curtin.edu.au. Retrieved 2018-07-05. ^ "Honours degree". The University of Sydney. Retrieved 2018-07-05. ^ "The Australian Higher Education System...Simplifi". www.studyinaustralia.gov.au. Retrieved 2018-07-05. ^ "Research degrees (MPhil, MRes & PhD) in Australia and New Zealand | Study Options". www.studyoptions.com. Retrieved 2018-07-05. ^ "Bachelor of Science (Honours) – Courses and Programs – The University of Queensland, Australia". uq.edu.au. ^ Unknown (2012-07-11). "Entry requirements: Graduate Research Degrees". futurestudents.unimelb.edu.au. Retrieved 2018-07-05. ^ "Ser Universitário – Tudo pra você chegar ao Ensino Superior". Ser Universitário – Seu Mundo Universitário & Educacional. ^ "PhD Programs, Timeline for McGill Sociology Program (MA/PhD1)=". Retrieved 1 November 2018. ^ "McGill Charter of Students' Rights" (PDF). Archived from the original (PDF) on 7 October 2016. Retrieved 10 August 2016. ^ "HEC Montréal – Admission – Ph.D." hec.ca. Archived from the original on 2010-07-16. ^ "Niveau de diplôme (degrees ranking)". ^ Fiona Cownie (2010). Stakeholders in the Law School. Hart Publishing. p. 267. ISBN 978-1841137216. ^ "Funding for Overseas Research Students Awards Scheme (ORSAS) is no longer available". orsas.ac.uk. Archived from the original on 2005-10-18. ^ a b Dale Bloom, Jonathan Karp, Nicholas Cohen, The Ph.D. Process: A Student's Guide to Graduate School in the Sciences, Oxford University Press, 1998, ISBN 0-19-511900-2. William G. Bowen & Neil L. Rudenstine, In Pursuit of the Ph.D. (Princeton UP, 1992; ISBN 0-691-04294-2). Growth of the Ph.D., Discusses innovations in doctoral training.